NARHA knows its current members are the best possible source for new members who could benefit from all NARHA has to offer. With our special Member-Get-A-Member drive, we've made referring colleagues to NARHA easier than ever! Click here to learn program details! Deadline is June 30! NARHA wants to thank its 2011 sponsors and exhibitors who have committed thus far. 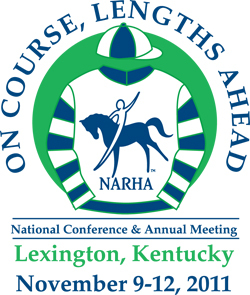 If you have any questions about sponsoring NARHA or exhibiting at the 2011 NARHA National Conference and Annual Meeting in Lexington, KY, please contact Megan Ream. Thank you to our friend and national conference title sponsor, Purina Mills, for providing travel scholarships for the equestrian award winners. The national award winner for each equestrian category: Independent Adult Equestrian, Adult Equestrian, Youth Equestrian, Child Equestrian and the NARHA Horses for Heroes Equestrian will receive travel scholarship reimbursement funds in the amount of $1,500 per winner. The funds may be used to cover the price of round trip flights or car rental and mileage to and from Lexington, KY, and the winner's hometown, hotel, taxi, shuttle or meals for the winner and his/her family or friends up to $1,500 for the purpose of attending the 2011 awards banquet, Friday, November 11, 2011. Receipts must be submitted with a NARHA reimbursement form to NARHA by the winner's center or nominator for reimbursement. A couple of regions asked for a few more days to finalize their nominations. We would love to see every region represented at the National Conference, so NARHA is extending our awards submission deadline to allow everyone a chance to take advantage of this wonderful offer from Purina Mills. Submit your awards nominations to the NARHA office by May 23, 2011 at midnight. After this all award nominations will close and any regions missing nominations will not be represented at National Conference in KY. The nomination forms are on our website in Word format to make it easier to type the information directly into the form. (Please be sure you save the form to your personal computer before you begin typing.) Click here to visit the NARHA Award Nominations page. Brant Gilbert, the Marketing Director of the Horse Business Group at Purina Mills, attended last year's awards banquet in Denver. He was so impressed by what he saw that he wanted to make a special contribution to help alleviate a hardship that travel to the banquet might cause. Thank you Brant and Purina Mills for your ongoing support of the NARHA mission. Centers will be encouraged to update their websites and printed materials to include the new association logo. Centers will receive new electronic versions of the logo on their "2011 Standards for Certification and Accreditation Manual" CDs, and logos will be available online for download. Centers have the freedom to update their materials as current supplies are exhausted and capacity allows. Centers are definitely NOT required to implement the change immediately. All we ask is that you do what you can to include the new name and logo, whenever you can. Watch your mailbox for surprises and more launch information coming soon! This is an exhilarating time to be part of an amazing industry. Thank you to everyone who has played a roll in making this association what it is and for helping with the naming process. Stay tuned! As promised, Brad Lewis submitted his recommendation for the existing EFMHA Yahoo Group. His recommendation originated from a 3-week poll of the 1,200+ members of the group. The outcome of this poll and of discussions outside of the actual polling was that the majority of those involved feel the group should become independent of NARHA, thereby allowing all to join regardless of NARHA membership. This recommendation has been brought before the Membership Oversight Committee for their approval. The EFP/L Membership Task Force is hard at work evaluating new and exciting possibilities for online communities that will target the needs of NARHA members interested in EFP/L. We welcome your ideas and feedback, and we will keep you posted throughout the process! It's not too soon to start thinking about the NARHA National Conference. There are going to be some great EFP/L presentations, a lot of continuing education hours and a really exciting pre-conference event. Consider registering early, as the savings are really worth it! Finally, in order to elicit the widest response possible, especially for NARHA's new EFP/EFL Award, NARHA has extended the awards nominations deadline to May 23, 2011. Be sure to get your nominations in for our exciting new award. Stay in touch and let us know if there is anything our task force can do for you! Abigail Hendren is the Credentialing Programs Representative for NARHA. A graduate of Webster University in St. Louis, MO, Abby studied film and creative writing. After graduating, she moved to the Denver area to work for a production company on a TV show for Food Network. While working in TV sounded glamorous, Abby decided to leave the media industry to join NARHA. Abby has experience volunteering with a therapeutic riding center in Missouri and is excited to be working to support the therapeutic riding community. Jeff Kelling is the Programs and Education Manager for NARHA. Jeff brings to the organization a broad and varied background in higher education and volunteer development. Prior to joining NARHA he has worked in field of community organization in Yukon Territory, Canada, as well as Colorado. He continues to teach as an adjunct professor at Regis University in Denver. NARHA has long had a procedure that all certification candidates must perform 25 hours of practice teaching under a current NARHA certified instructor in order to complete the certification process. These hours can be started at any point and are good for two years within your certification date. They need to be group lessons taught to students with disabilities under the direct supervision of a current NARHA certified instructor acting as the mentor who is giving feedback to the certification candidate. These practice hours should include instruction of a riding skill. It has come to our attention that many potential certification candidates or instructors in training are not confirming their mentor is a NARHA certified instructor. The office highly recommends calling to verify their certification; look online in the NARHA membership directory or ask for a current NARHA certification/membership card from your mentor. Effective June 1, 2011, if any candidate attends certification and tests without having 25 group hours of practice teaching under a current NARHA certified instructor, he or she will be invoiced an additional processing fee of $150 to be paid to the NARHA office prior to his or her certification results being released. A certification candidate cannot act as an instructor until this fee is paid and the hours are completed within 90 days of notification from the NARHA office. If the hours are not completed within 90 days, you will begin your certification process from the beginning. Ultimately, it is every candidate's responsibility to ensure all requirements have been met by the appropriate deadlines and that his or her mentor is a current instructor with NARHA. Be sure to review all policies and procedures in the NARHA registered booklet, updated frequently on the NARHA website. In addition to this update, please be aware that any certification candidate who tests at a certification after June 1, 2011, needs to demonstrate a proper posting diagonal for their riding pattern. This is a criteria in the certification booklet. In the past western riders did not need to show a proper posting diagonal; this policy has been changed. All riders, no matter the discipline, must show a proper posting diagonal. If you need assistance, please consider taking lessons from a qualified instructor to learn proper posting diagonals. If you have any questions, please call (800) 369-7433. Abby Hendren (ext. 104) and Jared Smith (ext. 126) are happy to assist you in your certification process. Wow, what a response we have had from our membership! So many NARHA members are interested in the new certification, NARHA Equine Specialist in Mental Health and Learning (ESMHL). The news of the new certification is traveling quickly, but we are hearing a number of common questions. In order to help clarify, we have provided answers to some frequently asked questions (FAQs) on the website. 3. What is the practical skills test? 4. How do I sign up for a workshop and practical skills test? 5. How do I locate a workshop and practical skills test? 6. What does this certification certify me to do? 7. What is the NARHA certified instructor option (previously known as the fast track option)? 8. Will the Equine Specialist in Mental Health and Learning certification be required in the future for all existing NARHA programs that offer EFP and EFL sessions? Visit the NARHA website for a copy of the certification booklet and complete details on the requirements of the ESMHL certification. Please feel free to email Tara McChesney or call (800) 369-RIDE (7433) with any questions you may have regarding the Equine Specialist for Mental Health and Learning certification or the workshop. NARHA's annual nomination process for region representatives is under way. This year nominations are being accepted for odd-numbered regions: 1, 3, 5, 7, 9 and 11. Click here for a nomination form. Please have all nominations to your current region representative no later than June 1. The ballot for voting will be available in July. It's grooming time, and occasionally this process is hurried so that we can get to the fun part: the riding! However, as we work around our horses, it is important to remember that they are not in a hurry. They live in the moment and aren't thinking about what's to come. If you are doing your job well, they are most likely enjoying the massaging and caressing that they are receiving. Along with enjoying each other's company, grooming serves as a great opportunity to check out the overall health and condition of your horse. Here are some tips to help ensure that the grooming process is enjoyable and productive. 1. Be mindful of brushing dirt and hair away from the eyes when grooming the face. You can even cup your hand over the eye to protect it while working the forehead area. 2. Be sure to avoid boney places such as the lower legs and face when currying, unless you are using a soft, flexible rubber curry. Then you can just go slow and be careful. 3. Watch the horse's reaction to how much pressure you are using on his body. If he is acting relaxed then it is a good sign that what you are doing is okay. If he is flinching or moving away, it is a sign that you may be going in too hard. Horses have different levels of skin sensitivity and tolerate pressure differently. You may notice that this can even be breed-specific. It's important to develop an understanding for each horse's level of sensitivity and share that with all who groom him. 4. Be aware when your horse flinches or collapses his body away from pressure while you are grooming. For example, when you are currying the back and he drops his back away from your touch. He could be telling you that his back is sore. There could be a variety of causes for such a reaction. However, ill-fitting tack is one of the most common causes. You should not ride this horse until you have the horse assessed by your veterinarian or other health care provider. It is also very important to figure out the reason for the soreness. Include in that process an assessment of your tack fit by a knowledgeable saddle-fitter. 5. Use a conditioner and/or go slowly when grooming the mane and tail. They really do feel when you pull their hair out. 6. Look for the "sweet spot." The horse will clearly tell you when you have hit it. They will often raise and twist their head, make faces and even move into the pressure. It's nice to spend a little extra time in those areas. 7. And lastly, when cleaning their hooves please be sure to gently set the hoof down when you are done. These creatures of flight are ever so trusting to allow us to tie them up and then lift their hoof. Let's respect the trust they are offering us and not rudely drop their hoof to the ground when we are done. Set it down gently and give them a pat to say "thanks." It is always in the horse's best interest to be handled in a predictable manner. Our goal should be to teach every student and horse handler how to be mindful and work with the horse in a consistent manner. In this way we can help to gain and keep the mutual respect of our equine friends. If you have any concern as to whether your horses may have been exposed, you can start by taking the horses temperature twice a day and while doing so make the horse yield the hind end away from you to see if there is any loss of coordination. If your horse is showing flu like symptoms, a temperature over 101.5 degrees and/or any neurologic symptoms, call your veterinarian right away. Jennifer Lemmon, the bookkeeper and treasurer of the board for Leg Up Therapeutic Riding Center, a NARHA Premier Accredited Center in Pulaski, TN, has put together a survey to provide statistical data for a grant request. The data collection is part of Jennifer's thesis for her degree but also provides data for a grant to complete capital improvements for Leg Up. These improvements will enhance the safety and comfort of the horses, riders and volunteers. Jennifer hopes to obtain data from organizations that may have completed their improvements, as well as some that may still be in the growth stage, as is Leg Up. If you would like to participate, click here to take the survey. If you would like more information, contact Jennifer or call her at (832) 495-8491. The spring edition of the Horses and Humans Research Foundation newsletter is on the HHRF website. It features an article about Molly Sweeney, HHRF founder and 2010 NARHA James Brady Award recipient, who is retiring from the HHRF board. Click here to visit the page. Unless otherwise noted, contact Tara McChesney at (800) 369-7433, ext. 114 for further information. All dates are subject to change. To register for an event, please contact the host site directly. You can locate their contact information under the Find a Center link on the NARHA home page or on the NARHA events calendar. Please direct correspondence about this newsletter to NARHA News coordinator. NARHA News is a benefit of NARHA membership. No portion of this publication may be reproduced by any mechanical, photographic, scanned or electronic process without written permission from NARHA. NARHA reserves the right to reject, accept and edit submitted material. NARHA News is intended as an information exchange and an opportunity for communication for members in the field of equine assisted activities. The opinions, practices or products presented in NARHA News do not necessarily reflect NARHA policy, imply NARHA endorsement or comply with NARHA standards.